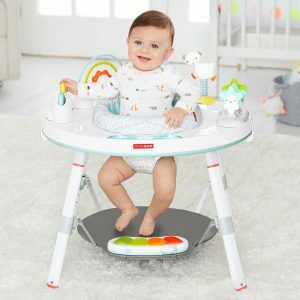 This multi functional Skip Hop Explore & More 3-Stage Activity Centre is the perfect baby gym that will transform & adapt as your little one grows. Designed in collaboration with a paediatrician, this baby activity centre supports a “whole body” approach to play and learning. The unique Discover Window gives little ones a clear view of their feet as they play the light-up piano to connect cause and effect. Four dreamy toys can be rearranged for customised play. As your child grows, the activity centre transforms for easy standing cruising. At stage three, it transforms into a sturdy toddler table with a plastic chalkboard surface for drawing, playing—the sky’s the limit!